Artist and design devotee Mark Baldridge calls his home and grounds his biggest work of art. Published on Tuesday, May 16, 2017. This article appears in the April/May 2017 issue of American Craft Magazine. The Baldridge family – Kaeson, 10, Mark, and Susan – in their living room in Midlothian, Virginia. The bookcase displays Mark’s work, as well as that of some students, former colleagues, and fellow artists – along with an assortment of eclectic finds. The house is easy to miss. A mailbox is all that marks the turnoff on the woodsy suburban road in Midlothian, Virginia, a few miles from Richmond. The home is set back among the trees, so the first glimpses show only the gray siding of a standard mid-’70s split-level. Once you get a clearer look, though, there’s nothing standard about it. Towers, seemingly grafted onto the house, erupt from the roofline. Concrete steps sweep up to the entrance, where a well-fed cat greets visitors with a scratchy meow. Groupings of gazing globes glimmer in the landscape. More globes march across a small inlet in the property’s pond, connecting the backyard to the woods where a treehouse perches, supported by four hickories. It’s the magnum opus of sorts of Mark Baldridge, who lives there with his wife, Susan, a painter and graphic designer, and their 10-year-old son, Kaeson. Baldridge – metalsmith, stained-glass artist, and all-around design perfectionist – retired three years ago from his job teaching art at Longwood University in Farmville, about 50 miles away. He’s been working on the house for some 40 years – and shows no sign of stopping. You had the original house built in 1976. Since then it has grown from about 1,700 square feet to about 3,000. What else has changed? Mark: It was a contemporary house, but very plain. I started working on it from the time it was built – building the fences, making new railings, building the planters in the front. When we started, it had no garage, no towers, no front porch, patio, office, or the addition. When did you start altering it structurally? It’s hard to remember – I know I built the chimney in the back in 1980, because I date the concrete. That one was destroyed in a fire, but I’ve built a new one. I built the small decorative pool in 1982 and built the first small tower off Kaeson’s room in 1996. The patio and office came in 1994 or ’95. When I built the office, I knew I wanted a garage, so I had the builders dig the footings really deep; it cost more, which my [then-] wife wasn’t too happy about, but I had them do it so we could put the garage there instead of elsewhere, and keep the view unimpeded. I was trying to plan ahead, and it’s worked out well with all the other changes. So you weren’t satisfied with the usual boxy building? In the beginning, I’d look up and just see a boring view. So I built a tower. And overhangs. I wanted to take the worst side of the house and make it the best side of the house. Why did you build that first tower? It was intended as part of my daughter’s room. [Mark has three adult children from two previous marriages; Susan has two adult children from her first marriage.] I thought she’d like a tower. I built it from scratch; the shape and size of it were determined by my limited budget. But the size is part of what makes it so charming, just like the guest bedroom in the addition. Yeah, but I really wanted everything 20 percent bigger. What about the other two towers? I built the tower by the front door before we built the addition in 2008, to compensate for spatial tension. The third tower has the big room with the trampoline. Susan: Yes, that was the whole reason for the addition. [Laughs.] 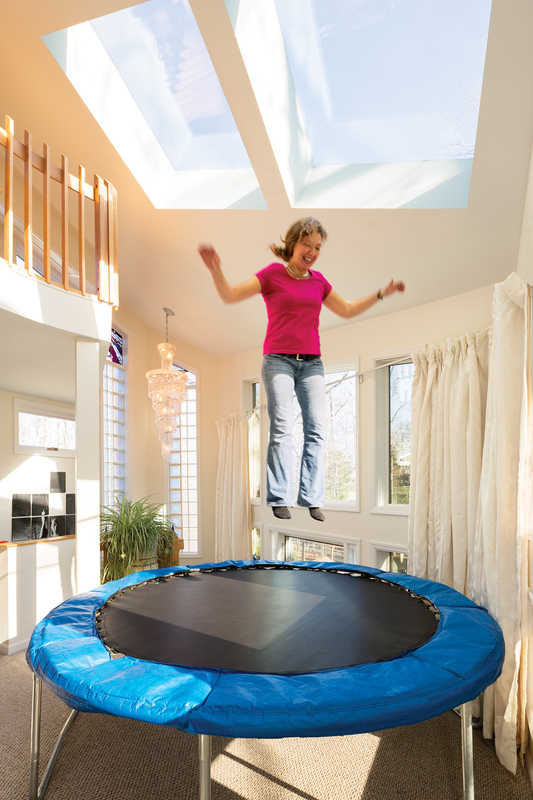 We were married in 2006, and I said, “I’ll come live with you, but I need a place for the trampoline.” It’s great exercise — if you do trampoline work, you can live forever. So he said, “The garage is mine, but I’ll build up for you.” I have my studio space in the loft above that room. Is there any kind of unifying theme to the house? Mark: I’d say it’s mostly on the outside. There’s a lot of upward movement. Things burst out. My design philosophy is to use as much variety as possible while still making it unified and organized. 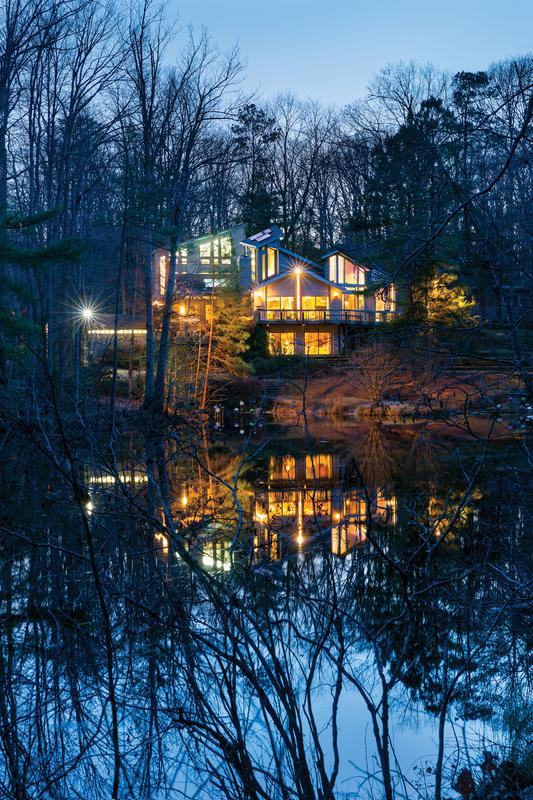 Susan: When you see the house from the outside, especially from the pond side, though, it’s like a crystalline tower. All the glass inserts Mark has done, when they’re lit up, it just glows. You see how it’s like jewelry, which was Mark’s first love. 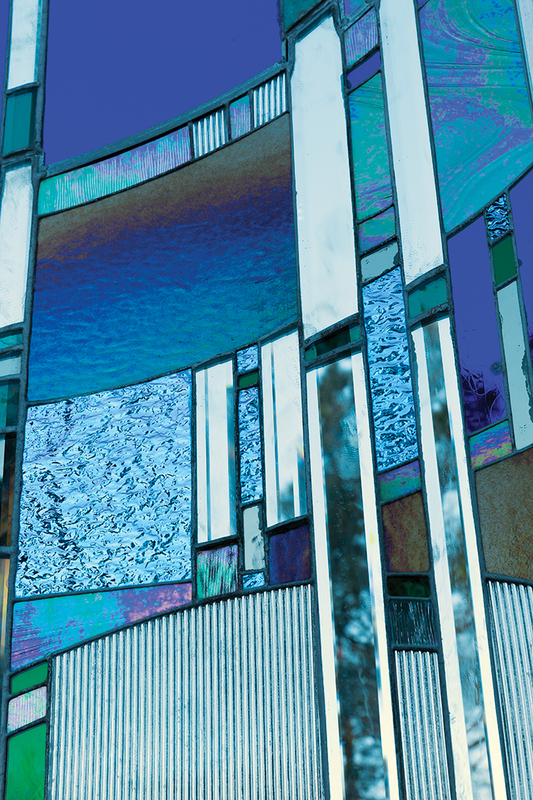 He went from jewelry to stained glass; now he’s doing stained glass, but as part of the structure. It just gets bigger and bigger. 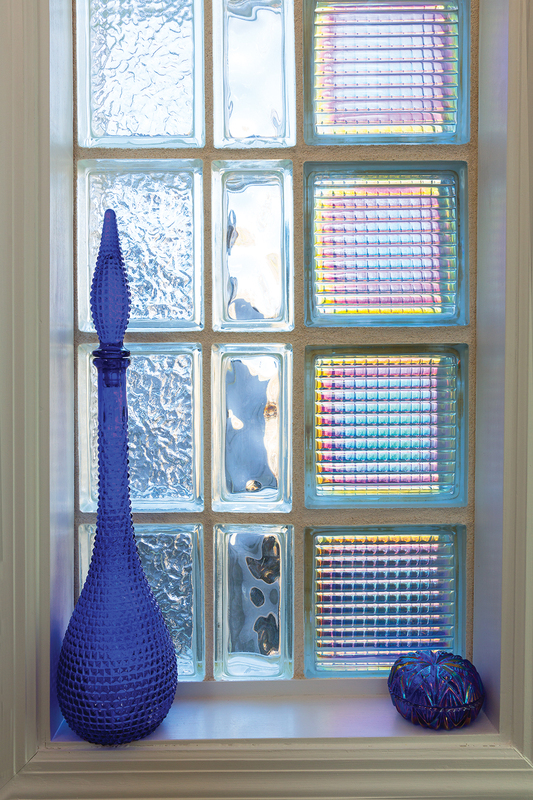 You have an eclectic mix of objects in the house – original items such as glass by Kent Ipsen, work by Longwood colleagues and sculptor Paul diPasquale, Susan’s work, your kids’ work, even paintings by the inmates you worked with in a prison art program. At the same time, you mix this work with a lot of found objects, such as animal skulls, and even mass-produced items like the gazing globes. Where did all those globes come from, and how did they end up where they are – in the fireplace, in the pool area, outside? Mark: I was just stockpiling the globes as raw material — I didn’t have a real plan. Susan decided to put them in the spots you see. Susan: There were boxes and boxes of them; rather than just leave them there, taking up space, I figured, “Oh, I’ll just put them in the yard.” I took them outside to complement the plants, and the rain can come down and keep them clean. So who does the arranging? Mark: Oh, it’s a mix. Sometimes she’ll change things. I’ll change things. I still have trouble following my own guidelines, though – I have too much, so I have the variety part but lose the “unified and organized.” Then I have to go back and strip some out. Susan mentioned that you started in jewelry then made a name in stained glass. But you also have building and even engineering skills. You were an art professor for decades, so where did you get those more practical skills? Mark: My father and grandfather were carpenters, so when I was a teenager I started working for them for a dollar an hour in the summer. It gave me enough of a start that when I began working on the house ,I learned as I went along. And I learned that you could take any house and dramatically change it. Anything’s possible; you can always find a way. You did the outdoor chimney decades before people started having outdoor fireplaces. And you have the gazebo at the edge of the pond. I built the gazebo in the mid-’80s. I had a lot of glass I had bought along the way, including some I bought at Steuben and some other industrial glass places. When I discovered iridescent glass, I decided to use up all my regular glass on the gazebo – but then I had to go buy more of the kind of glass I was trying to get rid of to finish it. What’s the story with the off-kilter uprights on the gazebo? When I built it, I thought I’d grow some wisteria on it – you see wisteria all over the place here. But it’s so strong and takes over so much that it started twisting the posts. Then I thought, I’ll braid the vines to contain it, and found out that just made it stronger, and it twisted all the posts. Which I had set up for specific sight lines. You don’t see it as collaboration between you and nature? [Sighs.] No. It’s – frustrating. Mark: I have a lot of projects in mind. Eventually I’ll do my stepping stones better. I’m thinking I’ll eventually build a bat house – that’s on my medium-range list. And I’ve got a chandelier I’m planning to build. I have 18 globes, I just need to connect them. Susan: Then it’ll shoot rainbows all over the room. It’s on the list. 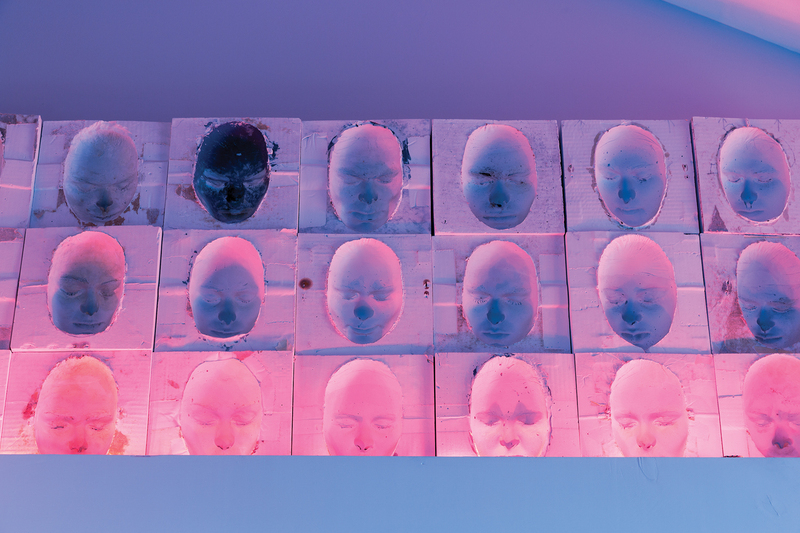 An experimental series of plaster of paris molds of students’ faces became a mesmerizing installation in the Baldridges’ master bedroom. 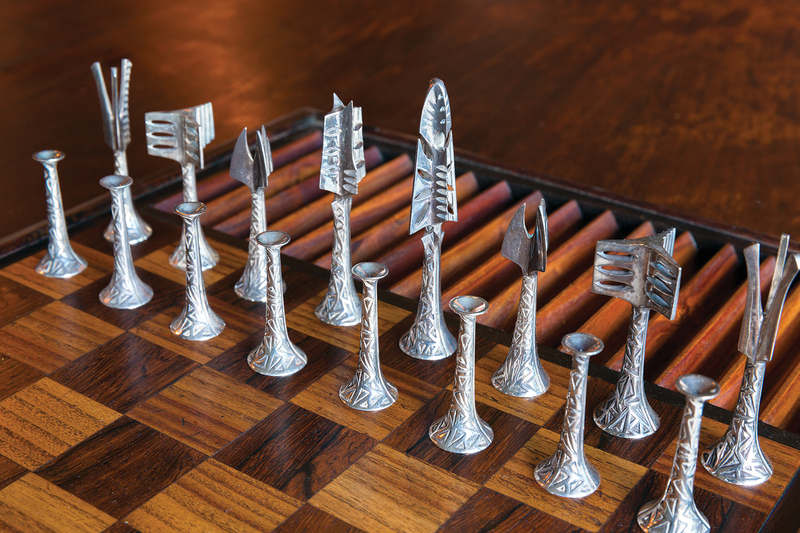 A sterling silver chess set by Mark. The board is made of poison sumac from a tree his grandfather had cut down. The wood isn’t chosen often, for obvious reasons, but Mark was drawn to it for its rich color. 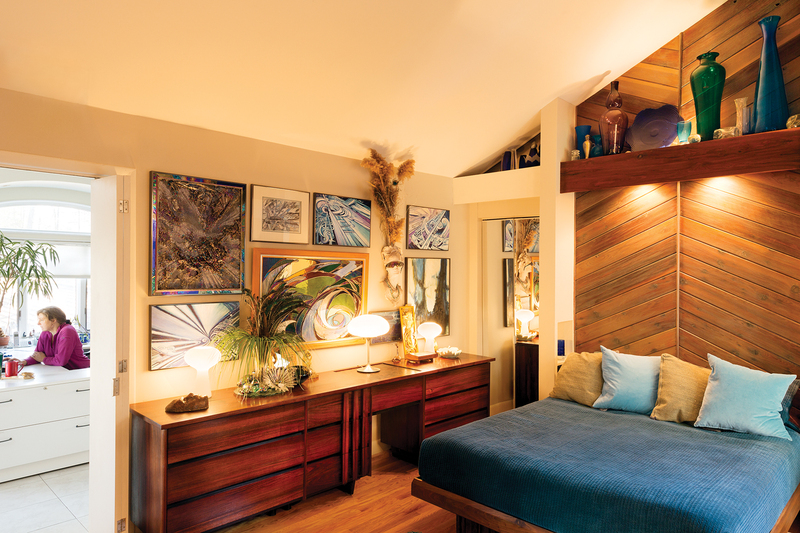 The master bedroom features a dresser of rosewood and ebony; Mark designed it in graduate school, and his grandfather, a master carpenter, built it. Mark went to art school for jewelry, but is happy to use any material that suits his design goals. Mark leaves no detail to chance. 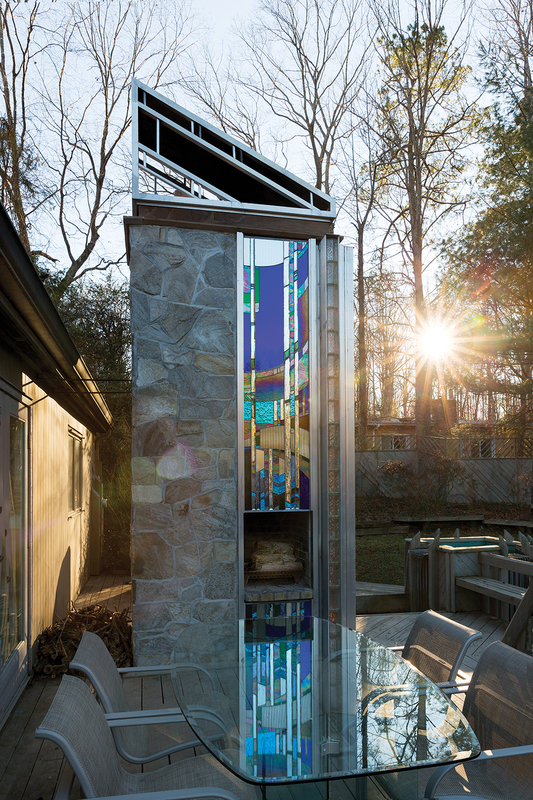 Besides the stained glass at left, he designed and installed the lighting fixture, as well as the glass block windows, which maximize natural light. 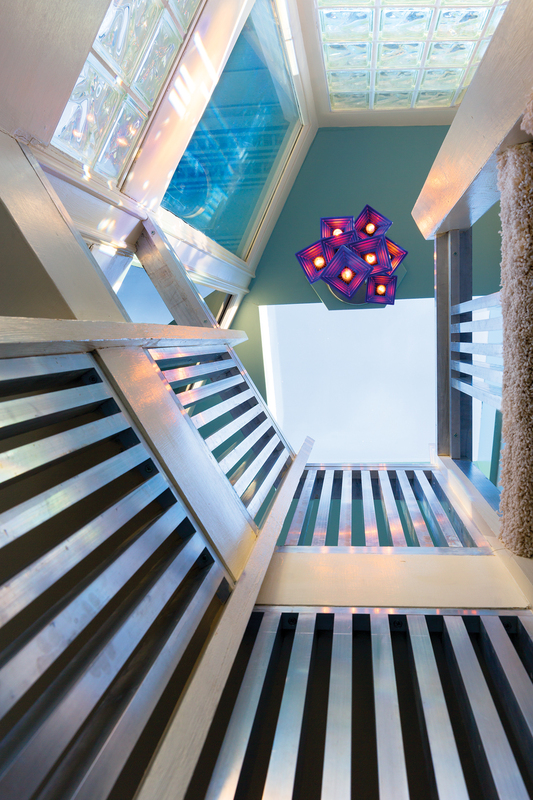 Long before outdoor rooms were even a concept, Mark designed and built a chimney on the back deck. When the original was destroyed by fire, he built a new one, with this stained-glass inset. 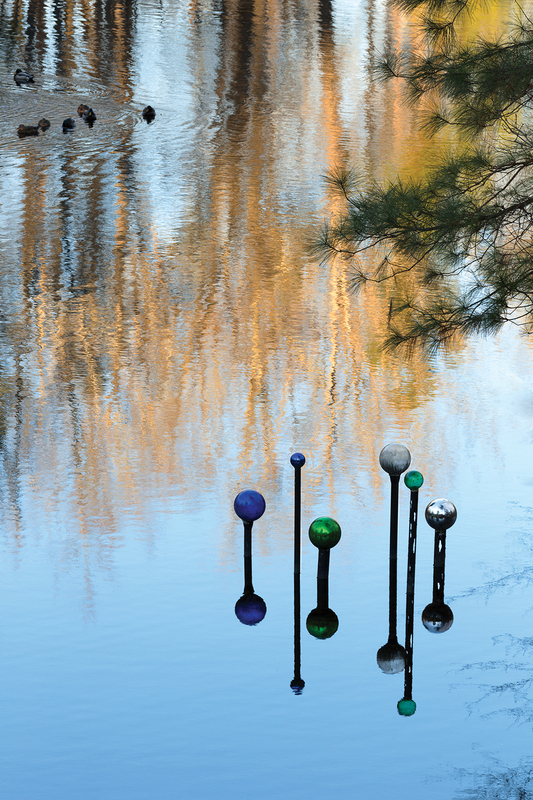 An inveterate collector, Mark amassed a stockpile of gazing globes; Susan – in part to reduce the number of boxes sitting in the garage – artfully arranged them throughout the house, garden, and even the pond. The first of three towers added to the house, this one was originally an offshoot of Mark’s daughter’s bedroom; it’s now Kaeson’s domain, a special perch with an all-original design, including the railings and lighting. The house’s once-ordinary silhouette has changed with additions of Mark’s design. 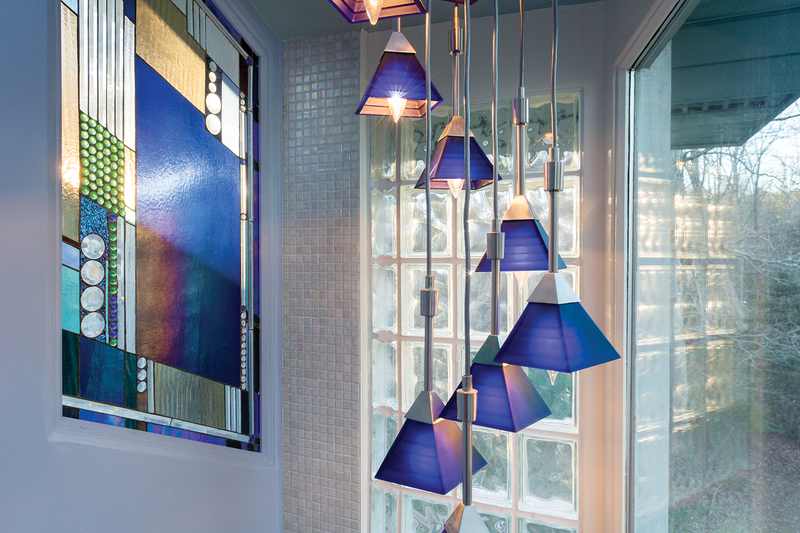 It’s no accident the home resembles a glowing jewel – he spent decades as a jeweler and stained glass artist. The play of light, color, and design are as important inside as out. 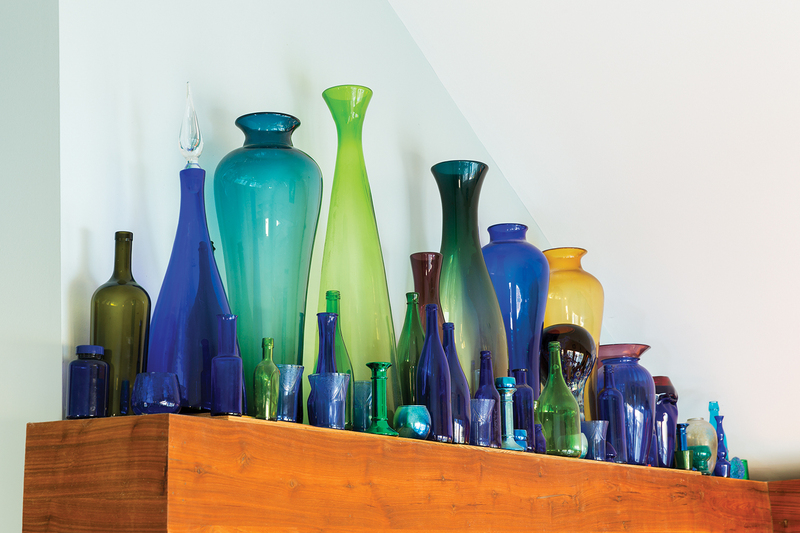 Glass vessels from all sources – vintage, glass factories, or simply store-bought – line shelves throughout the house. Neither Mark nor Susan necessarily makes a distinction between handmade and mass-produced; they display what pleases them. 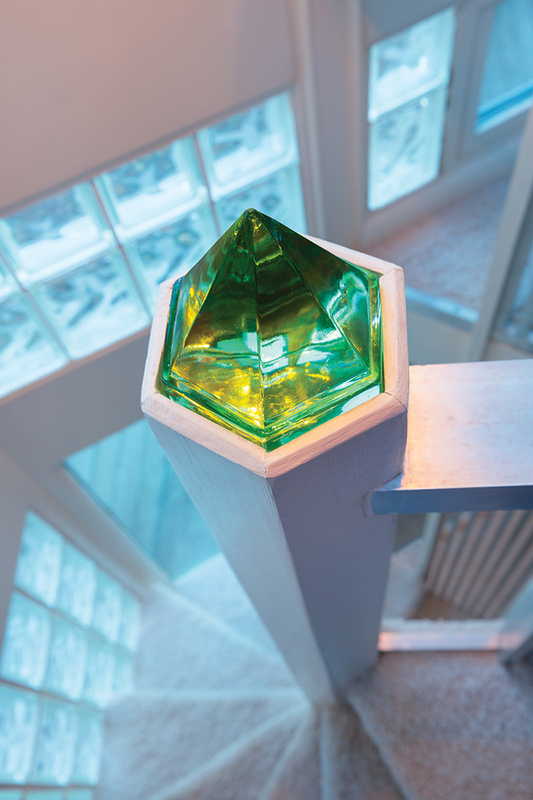 A glass pyramid tops the newel post in Kaeson’s tower, echoing the semi-pyramid silhouette of the house itself.